Birthday Limo Hire and Car Hire for Birthdays… treat yourself or your birthday person to a special surprise for the day and let provide the breathtaking transportation that you will never forget. 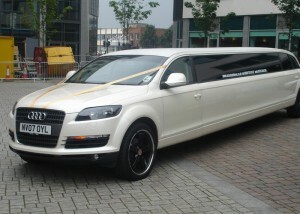 A Private Birthday Party Limousine Hire is the perfect present for your dear & near ones on their birthday. We can even decorate our limo with flowers. banners and balloons on special request, in choice of colours. We will attend to all your needs, leaving you relaxed and calm for your celebrations. Take a photograph, play your favourite music and let the evening begin!! Call today to reserve a limo for your Birthday. Here at Ace Star we offer Birthday Limo Hire and Car Hire for Birthday Parties and our promise to you is to offer the finest & latest Limousines available in the UK.